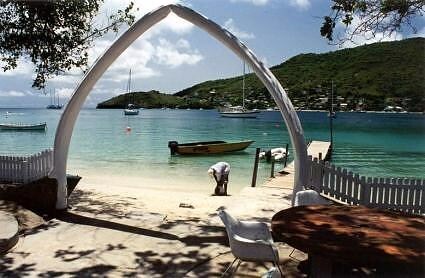 Tucked in just under St. Vincent, Bequia is one of the few places left in the world where the citizens are allowed to hunt whales. With permission from the International Whaling Commission, the natives of Bequia can catch up to four Humpback whales per year. As the hunting has to be done in the traditional method of hand held harpoons launched from open sailing boats, this four humpback whale a year limit is rarely met, and in fact some years, no whales are caught at all. However this island has a history and traditions wrapped around a tropical whaling industry, which can be found throughout the island, making Bequia a very interesting stop on your yacht charter itinerary. Bequia, which is one of 32 islands that make up the Caribbean nation of St. Vincent and the Grenadines, has a long tradition of whaling and building open sailing whaling boats. Whale hunters watch for whales day in and day out. When a whale is sighted, all hands race to the sailboat built for whaling. First rowing out to sea in the open sailing craft, the sail is then set to glide silently up to the whale where a harpoon is thrown into the flank of the whale and the ride commences, with the open sailing skiff towed behind an angry whale while all hold on tight. 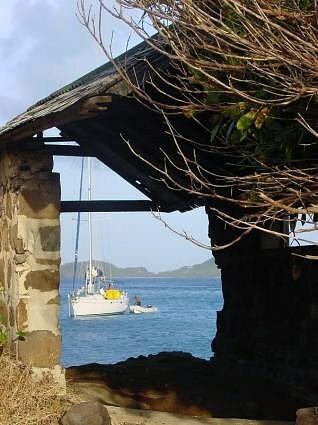 Once the whale is caught and killed, the whale is towed by motorboat back to Bequia where all of Bequia stops, schools are closed, and everyone converges on the whaling station to help butcher, clean and salt the whale meat and cut away the blubber. Usually an impromto whale meat barbeque is started right on the beach to keep the villagers fortified during the job. Anyone that helps walks away with whale meat. Whaling was brought to the island in the late 1800’s, when a local Bequian made his way to New England and onto a whaling boat. 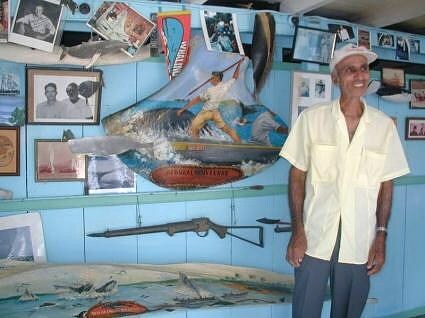 20 years later, he returned with full whaling knowledge and harpoons. The boats were built on the island and whaling became an important part of Bequian economy and food resources. However now whaling is only done by a handful of Bequians. Finding whale meat and rendered blubber on the island is difficult. Especially as the rendered blubber is said to cure all ills and therefore is carefully kept as a prized possession. However the history of whaling on the island is being preserved in the local whaling museum and boat building continues as an important part of Bequian industry. Visit the Northrop and Johnson Website Today!